With strains of Jazz/ Hip Hop and Breakbeat The Herbaliser (an English duo) have been making great albums since the mid 90s and have worked with Jean Grae, MF Doom and Roots Manuva. Their music while never abrasive is always a little off centre and each album sounds different. I have just about completely worn out my copy of Blow Your Headphones (well not really possible, cuz its on my harddrive, but you get the idea). 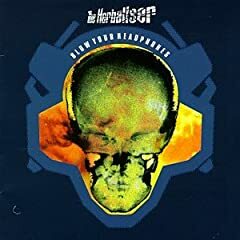 Very Mercenary's probably my favourite Herbaliser album: both the collaborative and 'solo' tracks on that record are awesome. From the amusing intro, Jean Grae's amazing performance on Mission Improbable to the film-inspired instrumental: The Missing Suitcase. Wall Crawling Insect Breaks is a class track which definitely rivals Coldcut in the cut-up stakes.